This Treadle favorite is back for another season! This supple jacket-weight fabric is made from a wool and rayon blend knit which has been lightly felted for lots of texture. The bonus with felted wool is that the cut edges don't fray! So you can take advantage of jacket and top patterns with unfinished edges and deconstructed details. And with colors as yummy as these, you'll want more than one. Stop by and see our great wool selection for yourself! We have some gorgeous new sequined fabrics for you! This chiffon fabric is totally covered with shimmering blue and green sequins overlapping like scales. The iridescent colors shift and change with every movement. It's truly a delight to see! Next we have this black velvet covered with flocked black sequins. Less shine, more soft, rich texture. Make your special occasion wardrobe a little more special. 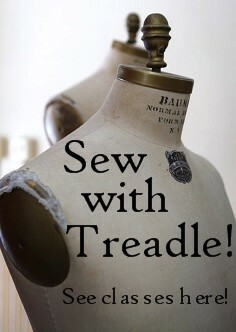 Find something beautiful and unique at Treadle today! We have new group of cotton double gauze prints. While double gauze's airy, lightweight softness is wonderful for kids and adults alike, these prints would be particularly charming for baby and nursery projects. From little dresses and shirts to blankets and swaddles, this double gauze can create all kinds of projects for sweet little ones. We have lots of pretty new trims in the store, including these fresh cotton sateen ribbons. Yes, that's right, cotton ribbons! These wonderfully soft natural fiber ribbons have a quiet sheen more subtle than polyester or silk. Plus they're double-faced, so that satiny gleam looks lovely on both sides. We have a huge selection of wool this fall, including a bunch of scrumptious wool knits! All the comfort of stretchy knit fabric plus the cozy warmth of wool. First up are these plush, textured mohair blends. The fluffy surface is quite delightful! But if heaps of texture isn't your thing, try these smooth wool double-knits. You know you need some autumn wool. Stop by and touch the fabrics! Our Japanese import section is bigger than ever, and here are a few of the latest additions. From soft florals to crisp lawn and geometric with a hint of metallic, there's so much variety, and all of it is gorgeous! We have a new group of textured cottons in a spectrum of softly heathered colors. The texture gives a softer appearance than a true solid, and adds visual interest. These cottons would be great in blouses and shirts, dresses, or pajamas! Time is running out on our Fabulous Fall Sale! Stop by now through Sunday to take advantage of the great discounts on wonderful fabrics. We have some smart new wool gabardine in the store, in an array of rich colors. Gabardine is what is known as a "hard-finish" wool, made from tightly twisted worsted wool fibers and woven in a twill weave to create a smooth, crisp fabric. It's ideal for dressy jackets, skirts, and trousers. Our Fabulous Fall Sale continues! Stop by now through Sunday for great discounts on wonderful fabrics.